Hannah, the most popular boat in the Bruce Trust fleet over the last 25 years, is scheduled for a complete refit and Berkshire Freemasons are delighted to be able to help fund this refit. The Bruce Trust provides canal holidays for disabled, disadvantaged or elderly people. The boats are of a special wide-beam design enabling wheelchair users to easily manoeuvre and to steer the boat using the tiller. Hannah also has a remote steering device to enable people with less upper body mobility to steer her with a joystick. 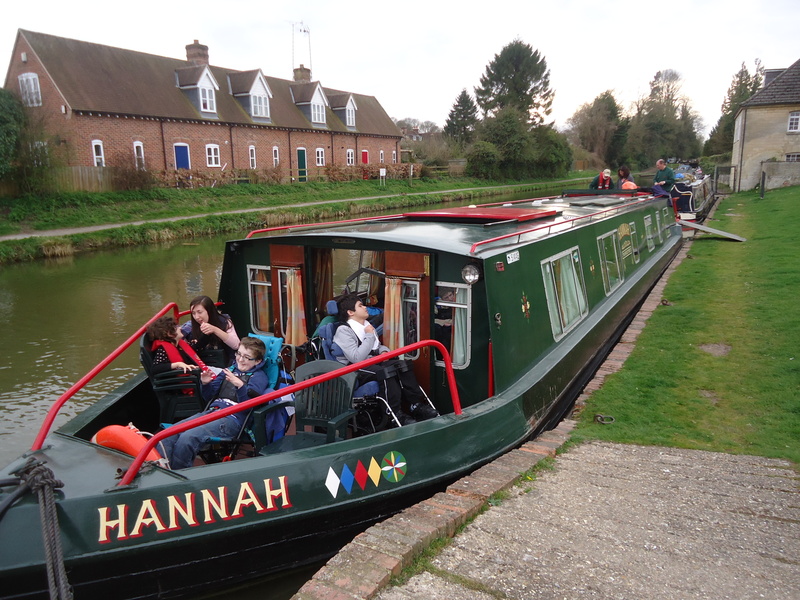 Hannah’s electrical and heating systems are scheduled to be overhauled and she will be modified to provide easier wheelchair access and improved welfare facilities. The result will enhance the experience and safety of her passengers, making her ready to be the pride of the fleet for the next 25 years. There has been a longstanding relationship between the Trust and Berkshire Freemasons and especially the Hungerford Lodge. Both masonic bodies have provided significant funding to the Bruce Trust. Rebecca Bruce, who oversees the day-to-day management of the Trust, and her father, David, who founded the Trust in 1988 with his wife Louise, greeted representatives of the Berkshire Masonic community and their families and friends at Great Bedwyn on Saturday 15th October. Among the Freemasons present were Peter Ludlow and Michael Tanner. Both have previously presented cheques from the Berkshire Masonic Charity (BMC) and Hungerford Lodge to the Trust and on this occasion, it fell to Peter to present a cheque from the BMC for £2,000 to The Bruce Trust at their home ‘port’ of Bedwyn Wharf. Those attending could see the whole fleet alongside and were invited to go aboard ‘Hannah’ as she begins her transformation and ‘Rebecca’ whose upgrade had been completed in 2013. Different vessels, but similar enough to give a ‘before and after’ perspective.